A Few days ago, We shared 20 most important Previous Year Algebra Questions for SSC CGL Exam along with solution. The above-mentioned questions are extremely important and are a bit tricky as well so you must check them. These questions have been asked several times in SSC Tier-1 & Tier-2 Exams. Anyway, Today we are going to share 20 Time and Work Questions you must solve if preparing for SSC CGL Exam. These are again some great questions which SSC repeats quite often. Unlike our last post, we are not providing you the solution of these questions now.The reason for this is, Time and Work is not a very tough or tricky topic so you can solve these questions yourselves. However, We can upload the detailed and tricky solution once we receive enough requests from you.You can request via commenting. A contractor undertook to finish a certain work in 124 days and employed 120 men. After 64 days, he found that he had already done 2/3 of the work. How many men can be discharged now so that the work may finish in time? How many men can complete 1/3 of the work in 60 days? 64 men can complete 1/3 of the work in 60 days. Two workers A and B are engaged to do a work. A working alone takes 32 days more to complete the job than if both worked together . If B worked alone, he would take 8 days more to complete the job than they both working together. What time would they take to do the work together? A.B and C can complete a work in 11, 22 and 33/7 days respectively. They started the work together but C left the work 2 days before the completion of the work and A left the work 1 day before the completion of the work. In how many days the work will be completed. 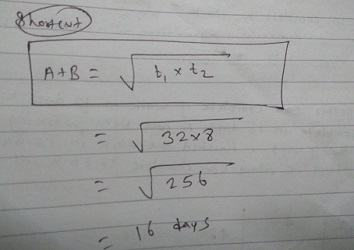 A and B together can complete a work in 12 days while B and C can complete in 16 days. A has been working for 5 days and B for 7 days. C finished the work in 13 days. In how many days, C alone can complete the 16.66% of the total work? A takes as much time as B and C together to complete a work. A and B working together can finish it in 10 days. 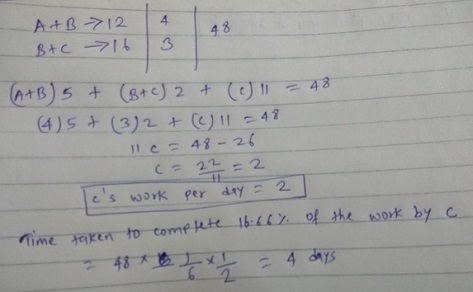 C alone can complete the same job in 15 days. In how many days can B alone complete the same work? 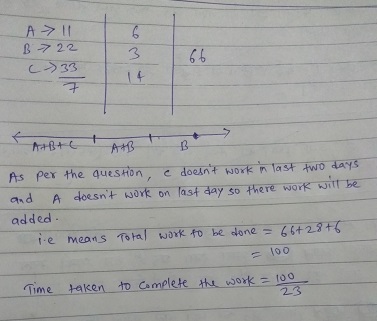 A is 50% more efficient than B and B is 25% less efficient than C. If B takes 12 days more to complete the work than C. Then, in how many days, A and B can complete the same work? A does half as much work as B in 3/4th of the time. If together, they take 18 days to complete the work. In how many days, can B complete the work working alone? A is thrice as good workan as B therefore A takes 80 days less than B to do a work. Then, In how many days, they can complete the work working together? A team of 30 men suppose to do a work in 38 days. After 25 days, 5 more men were employed and the work finished 1 day earlier. How many days would it have been delayed if 5 more men were not employed? 40 men can complete a piece of work in 40 days. They started the work together but, at the end of every 10th day, 5 men left the job. The work would have been completed in? A group of workers was put on a job. From the second day onwards, one worker was withdrawn each day. The job was finished when the last worker was withdrawn. Had no worker been withdrawn at any stage, the group would have finished the job in only 55% of the scheduled time. How many wokers were there in the group? Ronald and Elan are working on a Assignment. Ronald takes 6 hours to type 32 pages on a computer, while Elan takes 5 hours to type 40 pages. How much time will they take working together on two different computers to type an assignment of 110 pages? 150 wokers were engaged to finish a piece of work in a certain number of days. Four workers dropped on the second day, four more wokers dropped on third day and so on. It takes 8 more days to finish the work now. Find the number of days in which the whole work was completed? 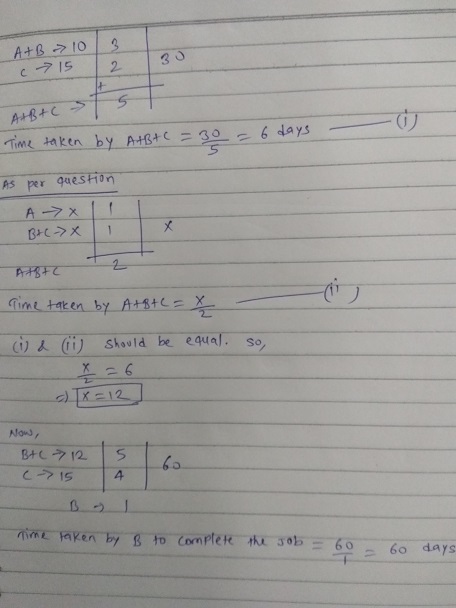 A and B have to write 810 and 900 pages respectively in a same time period but A compltes his work 3 hours ahead of time and B completes 6 hours ahead of time. How many pages did A write per hour if B wrote 21 pages more each hour? Three men A, B and C working together can do a job in 6 hours less time than A alone, in 1 hour less time than B alone and in one half the time needed by C when working alone. Then A and B together can do the job in?